I’ve just finished a Facebook game, so here a quick tutorial on how to use Zend Framework to build a Facebook Application. Facebook will be a proxy between your server and the user’s browser: it will load a page form your own server like a normal browser, parse it, “enhance” it with his components and then embed it in a Facebook page. You will use standard HTML tags plus FBML tags. We’ll start with FBML since its easier to use and to find help about on the forums. However take a look at XFBML in the future, since the Facebook team has really improved it recently and they are trying to push them on par. See facebook wiki for further details on the differences between FMBL and IFRAME. First of all, setup your FBML app and write down your api key and secret key. it is something like: http://apps.facebook.com/*APPLICATION_NAME* and it is the url through the user can reach your app. While the Canvas Callback URL (for example: http://www.yourserver.com/fbapp) its the address of your own web server, where you’ll deploy your application. With a dynamic dns service like dyndns you can create a domain name that map to the public address of your development machine, so that you can host your app on your dev machine while allowing Facebook to reach it. After you have done with the setup, you can use the official PHP client to interact with Facebook. 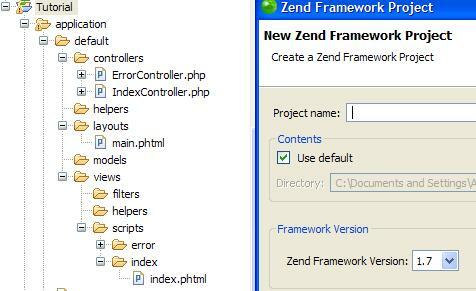 First, set up an empty Zend Framework project: you can use the Zend Studio for Eclipse wizard or the new Zend_Tool command line. Then, download the client and copy the files in the php folder of the archive to the library/facebook folder of you Zend Framework project. Now you can start using the client. The line: $err = error_reporting(E_ERROR); is needed to hide some strange php notices from the facebook.php file. In the line 12 we instantiate our client with the api key and secret taken during the application set up. With the require_login method you can require the user to “add” your application. Notice that many api features are available only if the user has added the application. See the complete list of methods on the wiki and try them with the API console tool. 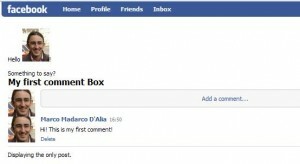 Now that you know how to interact with Facebook, you can show a simple page containing the “Comments box” component. As you can see we don’t have to put the standard html opening tags in your layout (<html><head>...) since Facebook will load the page from your server and embed it in his own HTML canvas page. We had also used our first FBML tag: <fb:title> to set the page title in the browser titlebar (we can’t use the ZF headTitle() method here). To experiment with the various <fb:* > tags use the FBML console. In the HTML source of the canvas page you can see the original FBML used to generate the page and sometimes some errors/warnings. It is almost like the standard one, but there are some differences and your existing scripts and libraries won’t work. If you want to embed an external .js file, you’ll have to specify the absolute path. Not only: Facebook will keep a copy of your script, even if you modify it, so you’ll have to put a timestamp in the url to force a cache refresh. In this way Facebook will load the script from the url: http://www.yourserver.com/fbapp/scripts/js.js?v=1231707071. When you’ll edit the file, the number will change and FB will reload it. CSS in FB is almost standard, but use absolute urls. Also be sure to write clean CSS, otherwise the Facebook parser will sometimes hang without and explanation. We can use a base controller class. We had made IndexController inherit from FacebookController, and used its method requireLogin, without requiring to set up the Facebook client. with the $simulateFb variable set to true you can preview your site outside the Facebook canvas page without requiring the login (but you’ll not see the FBML components). Also the FacebookController will allow the standard Zend Framework _redirect method to work and will bind Zend session to the one of Facebook. Finally in the last line we set up the charset encoding to be sure it will be the same of the Facebook canvas page. now download the tutorial sources and start building your own Facebook app. Great tutorial!!! I’ve been waiting for something like this for a long time. @Chris: I haven’t tried to use Zend_Rest_Client with the Facebook api, however I think the official fb php client has some features that the Zend_Rest_Client doesn’t have, like the session_key and facebook authentication management or the requireLogin method.